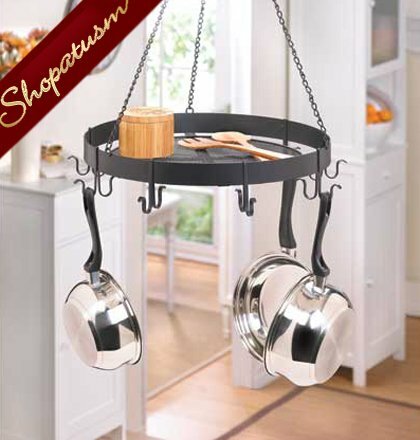 This is for a Black Metal Kitchen Round Hanging Pot Holder Organizer from Shopatusm. This handy and attractive hanging pot holder will clear cupboard space and put your pots and pans in easy reach for when you're whipping up a mealtime masterpiece. There's even space for storage on top! Item weight: 8 lbs. 17 3/4 inch x 17 3/4 inch x 27 inch high. Iron. 8-piece hooks included.